Pir Habibur Rehman, resident of Philadelphia, Pennsylvania, was brutally murdered today while in his native country of Pakistan at around 9:30 AM, Pakistani time. Mr. Rehman was in Sindh, Pakistan, when he stopped at a traffic light while driving his nephew and workers to his farm. At that time, two masked gunmen approached his vehicle and opened fire. He was rushed to the hospital but was pronounced dead on arrival. His nephew and workers survived the incident. Mr. Rehman was a tireless worker for the Ahmadiyya Muslim Community. As Vice President of Muslim Television Ahmadiyya’s USA Studios and the community’s international website (alislam.org), he channeled Philadelphia’s motto of brotherly love into his ability to lead strong teams. He owned a photography store and newspaper stand in Philadelphia and is survived by his wife, two daughters, and a son. 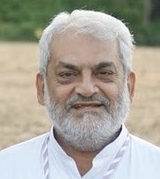 Mr. Rehman is the second member of the Ahmadiyya Muslim Community to be killed in the first week of Ramadan in Pakistan. Dr. Najam al-Hasan, a pediatrician, was shot and killed earlier this week outside of the medical clinic in Karachi where he worked. These appalling acts are a result of Pakistan’s constitution, which subjects the Ahmadiyya Muslim Community to intolerance, injustice, and death with over 260 murders to date since 1974. Such state-sponsored persecution is due to constitutional amendments declaring members of the Ahmadiyya Muslim Community as “non-Muslim” and criminalizing their religious activities. Amnesty International reports that Pakistan does not prosecute those who kill members of this community, thereby leading killers to continually attack these peaceful Muslims without fear of legal action. Mr. Rehman’s brother, Dr. Pir Mujeeb ur Rehman, was murdered 4 years earlier due to the same extremism perpetuated by these laws. Ahmadiyya Muslim Community is a dynamic, reformist and fast growing international movement within Islam. Founded in 1889, the Community spans over 190 countries with membership exceeding tens of millions. Ahmadiyya Muslim Community USA, established in 1920, is the first American-Muslim organization. Ahmadiyya Muslim Community is the only Islamic organization to believe that the long-awaited messiah has come in the person of Mirza Ghulam Ahmad (1835-1908) of Qadian. Ahmad claimed to be the metaphorical second coming of Jesus of Nazareth and the divine guide, whose advent was foretold by the Prophet of Islam, Muhammad. The Community believes that God sent Ahmad, like Jesus, to end religious wars, condemn bloodshed and reinstitute morality, justice and peace. Ahmad’s advent has brought about an unprecedented era of Islamic revival and moderation. He divested Islam of fanatical beliefs and practices by vigorously championing Islam’s true and essential teachings.